Being a latchkey kid, I found a way to watch most R-rated movies I wanted to watch. Somehow, I got my uncle to take me to an R-rated showing of Terminator 2, and by my math, I must have been 10 years old at the time (Uncle Harry: your daughter may still hold a grudge about this). My wife, on the other hand, had virtually no exposure to the big R-rated flicks, either directly or through friends who would spoil them for her. I got to show her the Terminator series with virtually no spoilers in advance. It was fun in a “this is the first time this person is experiencing this awesome thing” sense. So one night I decided to show her Alien. She knew nothing about xenomorph life cycles, and I suppose you could technically call the lack of warning, ahem, less than savory behavior on my part. I reasoned I could wrap my arm around her and protect her. I also reasoned that I wanted to see her unalloyed shock during the infamous “chest burster” scene that traumatized so many. We arrive at said scene and, true to form, my eyes aren’t on the screen. They’re on my wife. ‘Maybe I shouldn’t have my arm around her,’ I reason. ‘If she grips down, she might break it.’ Surreptitiously, I withdraw my arm. …and Katie busts out laughing. It’s not even nervous laughter. It’s “gosh, what a knee slapper!” mixed with surprised recognition. The alien in the movie skitters away. In our Eastern Religions class, Dr. Rennie used to talk about heterophenomenology, the idea that you can’t fully learn about a culture or religion by experiencing it for yourself, because your own cultural preconceptions inevitably get in the way. It’s sort of that way with my wife and Alien. She never saw the horror film that spawned the infamous chest burster scene, but it was so suffused in culture that she couldn’t entirely escape its orbit. 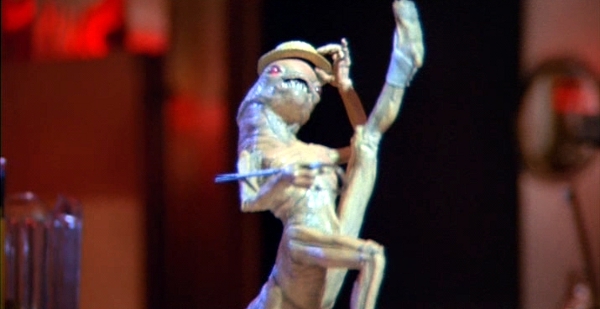 To her it wasn’t horrific at all; it just reminded her of a dancing alien with a brimmed hat and cane.